The Cascades are a chain of mountains that extend from northern California through western Oregon and Washington State, into southern British Columbia. The mountains are made up of lava and volcanic materials. Many of the peaks are "extinct" or "dormant" volcanoes. Lassen Peak and Mount St. Helens are the only "active" volcanoes in the United States outside of Alaska and Hawaii. Mount Rainier (14,411 ft; 4,392 m.) in Washington and Mount Shasta (14,179 ft; 4,322 m.) in northern California, are the highest peaks in the range. 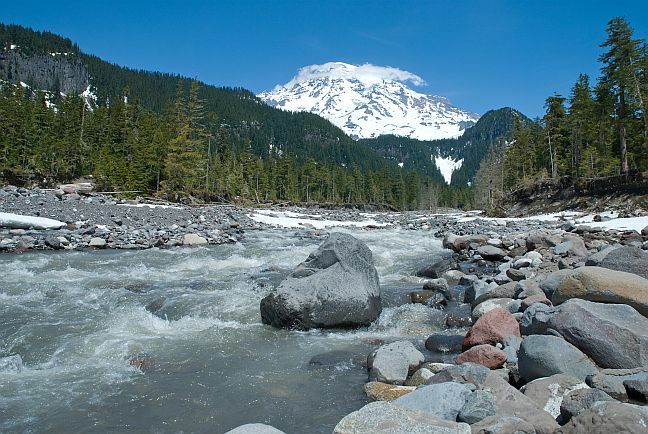 Other peaks include Mount Adams (12,281 ft; 3,743 m.) in Washington and Mount Hood (11,249 ft; 3,429 m.) in Oregon. Rainfall is heavy on the western side of the mountains, but the mountains near Mazama and east are much drier. Streams have cut deep valleys into the mountainsides, which are covered with heavy forests of fir and pine. Many rivers cut through the range, including the Columbia River, and beautiful turquoise blue glacial lakes are found here. I have spent many weeks hiking, climbing and camping in these mountains, and to date this range is one of the most beautiful mountain places I've ever visited. I haven't seen "Bigfoot" yet, but have enjoyed some great times on Mt. Baker (10,781 ft; 3,286 m.), Mt. Shuksan (9,131 ft; 2,783 m.), the temperate rainforest and other areas. So be sure to check them out if you ever have a chance.